5 Best Plate Carriers Reviews - Excellent Protection in 2019! Do you want to learn how to choose the best plate carrier? Then this review is what you need! You’ve probably heard this advice a million times – protection comes first. This idea penetrates all spheres of our life. Body armor is no exception. 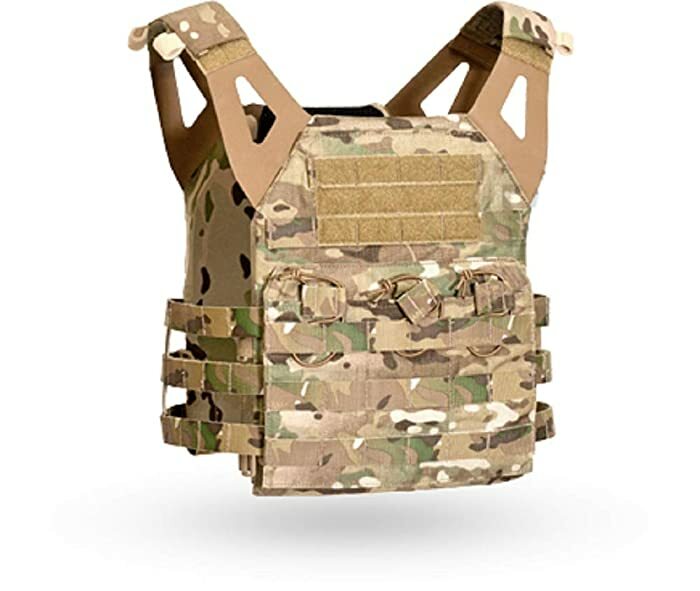 There are various constructions of plate carriers characterized by versatile sizes and the possibility to install a ballistic plate to repel handgun and rifle shots. These devices are made to protect the most essential organs, such as heart, lungs, stomach, etc. They are designed to be light and comfortable to wear. The idea is to cover the essential body parts without slowing down your movements. Of course, body armor was initially invented for military use. Early types of bulletproof vests are known to the history of the 16th century. Basically, with the invention of the firearms, people started seeking body security. But nowadays more and more civilians are interested in these devices. They are perfect not only for tactical purposes but also for hunting, traveling and such sports as paintball or airsoft. there are various accessories options. Let’s get started with 4 main features you need to pay attention to when buying a plate carrier. Attention, beginners! When I talk about the size, I mean the plate size. When you see the manufacturer describing their product as medium or large, they are addressing the size of a ballistic plate that can be installed. Sizing of the vest as clothing is not a concern as it is always adjustable. You need to pick the right size according to your body type. The medium is most commonly worn by all kinds of users. The weight of the vest really matters. Because these items are constructed to be worn for a long time. You’ll wear them together with a handgun and accessories that add weight. So it is important to stay concentrated and not get tired fast. All the items I’ve picked for you are characterized by the high level of possible adjustments. The shoulder straps and Velcro side straps are modifiable. This is an advantage because it ensures an awesome fit for any user. Regarding adding accessories, I should mention the MOLLE system. It was invented for military use to create the possibility to attach lots of pouches and compartments. The idea is to take all the necessary equipment with you and place it ergonomically and with quick access. Every device I’ve picked has its own specific advantages that make it an excellent choice depending on your purposes. Some features have integrated hydration system for user comfort. Other can carry up to 223 handgun mags! The capacity of an item can be increased with the attached extensions and pouches. I’ve found an interesting and short video regarding this topic. It dwells on what to put on your plate carrier and what accessories you really need. I know it is hard to resist the temptation to put everything on. But the more weight you carry, the faster you get tired. So don’t take things you won’t need. Now when you have the general idea what to look for, let’s discuss 5 superb options. I couldn’t believe my eyes when I discovered this item! It is impressively good and efficient regarding security. First of all, I should mention the use of the lasting and remarkably protective materials. The 1050D nylon is a heavy-duty fabric, which is excellent when it comes to body armor. It is very strong and can hold a lot of weight. The plate carrier provides the ability to bring all the necessary belongings and accessories with you. So the fabric of the item should be capable of holding the weight of added ammunition. The shoulder strap is made of cotton, and this is excellent as it is trustworthy and kind to your skin. Sure thing, I don’t expect you to wear body armor without a shirt underneath. But you can imagine how important it is to wear something that won’t harm you or irritate skin. This item is suitable to serve any purpose – you can wear it for paintball protection, put it on while hunting, wear it outdoors or as sports gear. It is multifunctional and secure as it includes 2 EVA foam protective pads. Sounds impressive, right? Worth to mention, it fits all users, and it is waterproof. Now, let’s jump right into the details! The item weights only 30 ounces which can be called lightweight. The less the vest weights, the more things you can bring with you. It fits in medium-sized plates, namely 10×12. This is the most common plate size. It is easy to find and suits the most customers. There are lots of reasonable adjustments in this tactical vest – for example, the length of shoulder straps, side MOLLE system, the belt. It is designed to fit both men and women and, therefore, all the parts are easy to customize. 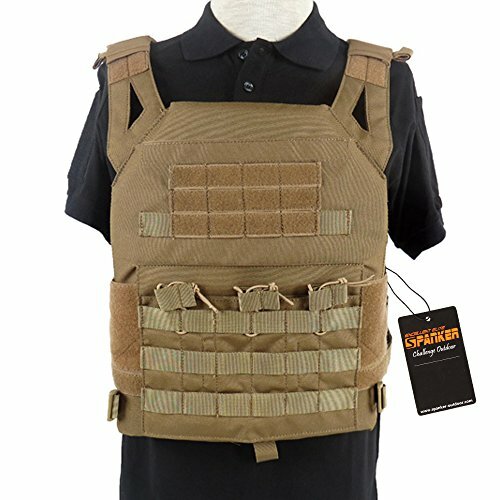 This vest features 3 pouches for rifle magazines, such as AK-47 or M4. The whole item is covered with MOLLE system, which allows you to mount lots of additional pouches and compartments. You can also include a water hydration system which is a handy thing in the field. This item is perfect for you if you are looking for something compact, lightweight, protective and functional when it comes to airsoft, paintball, and outdoor sports. Among the most advantageous features of this device, I should mention the lasting materials, high personalization abilities, MOLLE system that allows you to mount lots of stuff. And last but not least – sides are naked which is excellent for ventilation purposes. By the way, it is available in 4 colors! It means that you can pick the right camouflage regarding your environment and purposes. This tactical vest carrier is produced by one of the most trusted manufacturers of gear and ammo – DLP Tactical. They are commonly known for the reliability and excellent quality. Let’s dig a little deeper to discover all the advantages of this particular product! This item is made for tactical training and operations that require a high level of mobility. The product construction ensures natural movements of the body – your arms remain free. It is manufactured from heavy-duty Cordura Nylon that ensures the strength of the whole construction. The MOLLE systems cover the device allowing mounting lots and lots of various pounces and accessories. But you know what? This particular item features quick on/off system. This is awesome for any tactical operations because you can quickly put it on and release at a glance. This is a plate carrier with plates – the soft ones are already included! So you are ready to go whenever you unpack your vest. This thing fits in the medium plates. Please note that this item is designed only for training, outdoor sports, and simulations. It can’t fit in any ballistic plates. The whole structure is light because of the superb materials used. The straps and cummerbunds are modifiable; therefore, it can be worn by almost any user. You can adjust the fit without any effort by altering the density of cummerbunds. The MOLLE system of this device gives you an opportunity to put on lots of pouches and compartments. The cummerbunds are stiff as they are covered with Kydex – you can mount various things on both sides simultaneously. It increases the capacity of the whole item dramatically. Are you ready to be amazed? The belly kangaroo pouch can fit in 3 .223 magazines! Astonishing, right? There is an admin compartment in the chest area where you can keep all your essentials, such as keys, mobile phone or additional mags. There are enough places to take an energy bar with you if you are going to have a long-term session. This is a remarkable option for those who seek a long-term service item. It is great regarding customization and capacity. The materials ensure the lasting and stiff construction. What is special about this vest? It is perfect for operations where you need mobility and free hands as it doesn’t affect the ease of movements. Please note that this carrier is not designed to be worn with ballistic plates, but the soft protective plates are installed. This is an outstanding product, designed and manufactured by Crye Precision. It is an armor plate carrier that is made for professional use and is characterized by the maximum protective capability. It is designed in Multicam camouflage pattern, which has been also invented by Crye Precision. This pattern is suitable for multiple environments. Not surprisingly, the law enforcement agencies and military institutes of almost 40 different countries, including the USA, use this design. Can I be totally honest with you? This product is a bit expensive. But it is entirely fantastic regarding the functionality and quality. It is very compact and portable; the construction is minimalistic and ergonomic. It means that it is simple to use and efficient in the field. The construction enables free movements of the wearer. It is incredibly comfortable to wear, which is essential when it comes to an ammo gear. You are going to wear it for a prolonged period, so it is better to reduce all the unnecessary weight. 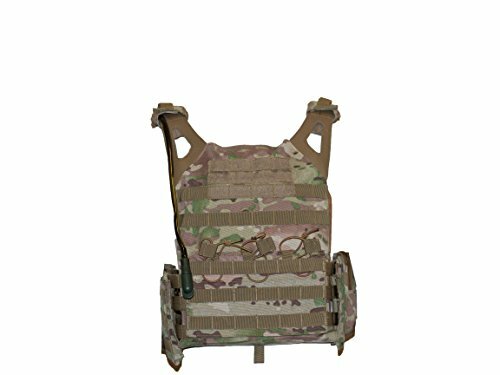 The cummerbund system of this tactical plate carrier is patented because of its innovative structure. It provides the ability to mount pouches from both sides – inside and outside of the system. The interior panel is covered with the breathable padded mesh. It is soft and kind to the body, and provides the ventilation to prevent overheating and extreme sweating. In case of emergency, this product can be removed from the body in 2 easy steps. This quick release function is necessary when it comes to the field conditions. This is a super light item, it weighs only 1.1 lbs! Such small weight makes it perfect for long-time campaigns and operations. The product is available in four sizes that correspond to the plate sizes. This is amazing because now you can choose the perfect plate size for you! And the material of the item is flexible so the thickness of the ballistic protection may vary. This vest is highly functional. The straps and cummerbunds are modifiable for a perfect fit on the body. There is a possibility of chest expansion. The basic construction includes the admin panel upfront with several compartments for things like mags, lights, maps. There is also a triple magazine pouch on the belly area. The MOLLE webbing covers the entire structure to the maximum capacity. You can mount all the added compartments from both sides, upfront or on the back. All the advantageous features of this product are described in the instructions provided by the manufacturer. There are lots of useful data regarding the installation of the added compartments and accessories. Check them out! It is definitely a life choice made for professional use! The manufacturer took all the requirements into consideration. It is comfortable, breathable, lasting and extremely functional. The mobility and lightness of this item are beyond expectations. There are tons of possible modifications. The capacity is incredible. The camouflage pattern is one of a kind, and the materials are fascinating. Still not convinced? Check this video – it shows all the advantages of this vest describing its functionality. This product is manufactured from the heavy-duty nylon for the added service durability. It comes in black color according to the law enforcement uniform items. 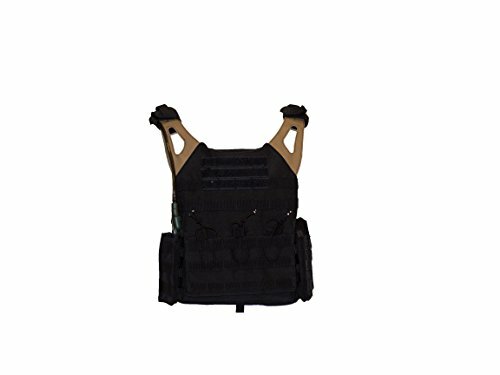 This device is similar to condor plate carrier as it can boast of the high quality. The flexibility of modifications provides the right fit for any user as it comes in one handy size. The internal mesh is breathable and soft. Two admin pouches are excellent for various things you might want to take with you. And the product is equipped with a bladder pouch! This is an excellent integrated hydration system that is necessary for active sports and operations. The advantage is that you don’t have to buy it separately and install – it saves lots of money and time! The material of the item is resistant to abrasion, water, and low temperatures. The sides are protected with the soft fabric panels featuring MOLLE stripes. This device is lightweight despite the fact that it has side panels. It fits in the medium size plates, and you can actually install ballistic protection according to your preferences. There is a possibility to fit in the steel, ceramic or polyethylene ones. The webbing of the device allows mounting various compartments. The side panels eliminate the possibility to wear added compartments from the inside. But it is a necessary sacrifice if we talk about the added protection for your body. The straps and Velcro on the sides ensure the adjustments for a perfect fit. The item comes in one size. There are two admin pouches included, and the hydration system is installed. 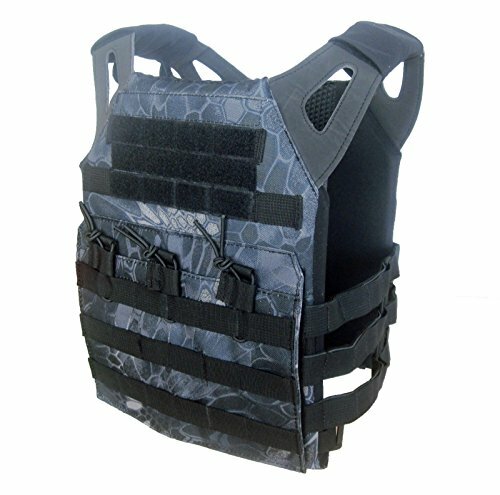 The front and the back are webbed with MOLLE stripes for greater capacity ability. You can mount three rifle pouches upfront on the belly area. Or you can wear handgun mags compartments. I would describe this item as having a significant capacity potential. In fact, this product is hugely inspired by the JPC I’ve reviewed above. The difference lies in the sides’ design as this item protects them with fabric panels. 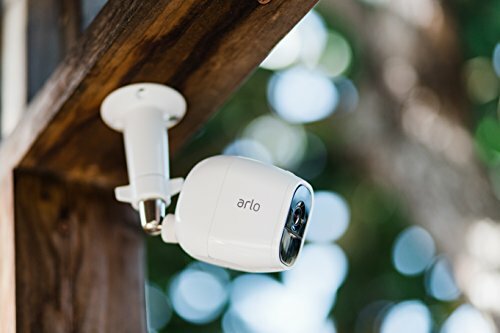 This is a comfortable and functional item that is quite light. It is advantageous regarding the durability and capacity potential. I should also remind you of the included bladder pouch. The material is lasting and stiff, the stitching is excellent. The shoulder straps are low-profile, and I recommend such construction to increase mobility. This is another multicam plate carrier. You already know about the advantages of such design. This product is not suitable for a concealed carry, but it blends perfectly to different environments because of the camouflage pattern. It is produced by the same manufacturer as the item described above and, therefore, it is characterized by the similar excellent features. The hydration system is presented by the installed bladder with the tube. It is advantageous in many contexts, mainly because you don’t have to take any bottles with you. Side protection is increased by the fabric panels. There are 2 roomy compartments on the sides to ensure a smooth and quick access to the essentials. The item is produced from the lasting materials, and the shoulder straps are covered with soft fabric from the inside. The low-profile design makes it suitable for any customer in one unisex size. The long-term service of this product is ensured by the solid stitching and excellent fabrics. This is a lightweight plate carrier that eliminates the unnecessary weight. The latter is extremely important as you are going to wear it for a long time. The more weight you put on, the faster you get tired. And during the serious tactical operations, it is required to be fresh and concentrated. Despite the fact that the vest size is versatile, the plate size is medium, which is excellent as it is one of the most commonly used. The adjustments are easy to make, the straps and Velcros are effortlessly altered according to your needs. The MOLLE covers the whole construction and allows the customized mounting of the added compartments. The side panels cannot be removed. This device is quite impressive in terms of the capacity possibilities. There are two admin pouches included with the purchase. They are great for lights, maps, phone or radio/GPS. The hydration system is a plus because it is already installed. Although you need to buy other compartments separately, they can be easily attached. You can wear 3 rifle mags compartments upfront or handgun mag pouches. Generally, I would recommend this item as a budget product with perfect capabilities. It is durable and functional. There are lots of spaces, and the overall construction is very comfortable. It ensures effortless movements. You can buy it for any outdoor sports such as paintball or airsoft. There is also a possibility to install ballistic plates to secure you from handguns and rifles. Nowadays different types of body armor become more popular with civilians. There are various reasons for this, but the main one is the urge to protect yourself and beloved ones. Another reason is sports activities, such as paintball, airsoft or other quite risky outdoor games. They are fun and challenging. To enjoy them you need to be safe in your outfit. Whether you’re a huntsman or want to be prepared for zombie apocalypse, it all adds up to this – body armor is an excellent way to secure you. I’ve reviewed 5 best plate carriers that are suitable for different purposes. Some of them are made with the idea of tactical operations; others are perfect for outdoor games. I hope that everyone can find an ideal option on my list. Feel free to leave the comments below and let me know which product you like most!